Properly maintaining your Ford Edge will significantly extend its lifespan and allow you to get the most for your money. Preventative maintenance is key to keeping more money in your wallet from season to season. While fall is still a few months off, it never hurts to be prepared! Here are some fall maintenance tips for your Ford Edge from us here at Sanderson Ford. Make sure your tires are properly inflated as the weather cools. 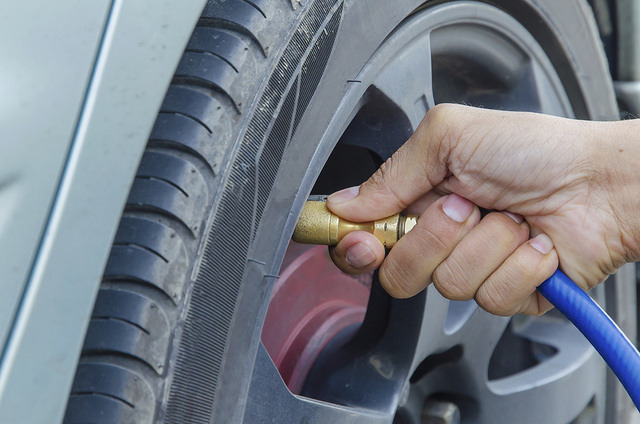 A car tire inflated to 35 pounds per square inch (psi) can lose one psi every month or for every 10 degrees. The fall tends to make things a little cooler and it never hurts to check your tire pressure as the weather begins to turn! Getting a tune up for your Ford Edge will only benefit you in the long run. In addition to extending the life of your vehicle, you’ll also enjoy an increase of around 4% when it comes to fuel economy. That’s a good chunk of change saved at the pump over the course of the season! Many Americans choose to travel during summer and that can do a number on your brakes. Make sure to have your braking system inspected as fall rolls around. Replace worn pads and damaged rotors if necessary. Your Ford Edge will thank you later!